The Pazifische Presse was so called both as an allusion to its location in Los Angeles and to emphasise its pacifist activities. Its aim was to offer a publishing outlet to writers who had been forced into exile after 1933, and had found a refuge in Southern California – Thomas Mann, Franz Werfel, Bruno Frank, Leonhard Frank, Alfred Neumann, Friedrich Torberg, Alfred Döblin and Lion Feuchtwanger. The Plantin Press printed all eleven titles in large octavo format on a variety of deckle-edged papers, using Fairfield font for the first five titles, then Fournier for volumes 6-9, and finally using Bembo for volumes 10 and 11. The printing was of excellent quality, and for the first seven volumes the print run was limited to 250 copies. The first 150 copies were intended for subscribers, and were signed by the author in the colophon, whereas the other 100 copies were intended as the trade edition, with a more simple binding and no author signature. 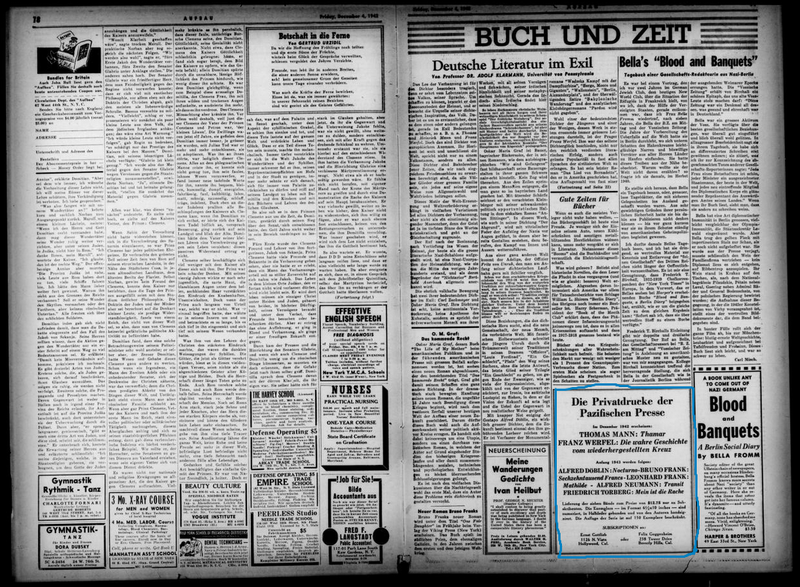 The invitation to take out subscriptions was made on October 20 1942 in Aufbau, the German-Jewish newspaper published in New York. (The Leo Baeck Institute offers access to a digitized version of all issues published between 1934 and 2004). A further advert appears in Aufbau in the issue for December 4 1942. The Library currently holds Friedrich Torberg’s Mein ist die Rache (F194.c.18.4), a novella depicting the cruelties of concentration camp life, which we have in the trade edition. Our other three titles are subscription copies signed by the authors. Alfred Neumann’s Gitterwerk des Lebens (F194.c.18.3) is a partial pre-printing of his 1949 novel Der Pakt, (748:35.c.90.78) based on the life of William Walker, the American mercenary who attempted to establish several English-speaking colonies in Latin America under his personal authority. 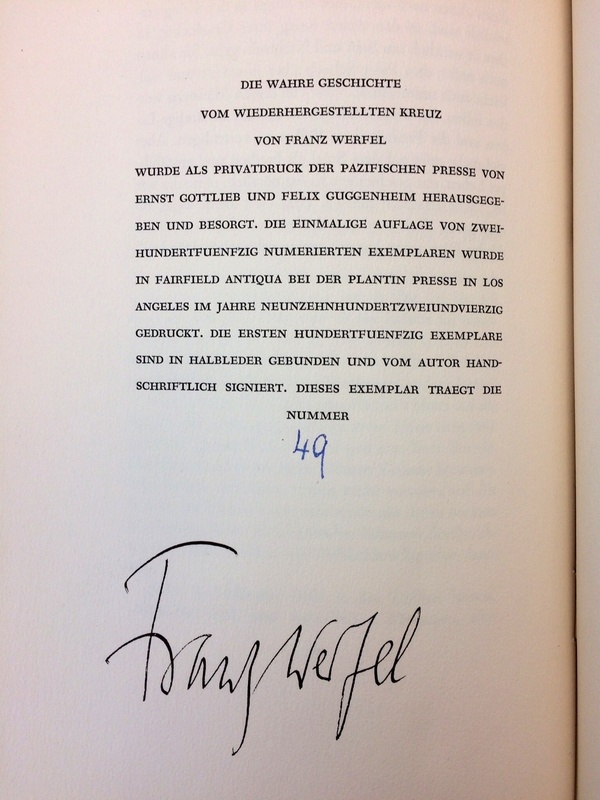 Franz Werfel’s story Die wahre Geschichte vom wiederhergestellten Kreuz (F194.c.18.1) is about the difficulties facing Christians and Jews in Austria after 1938. Alfred Döblin’s Nocturno (F194.c.18.2) deals with the German revolution of November 1918, and includes some pre-printings from his 1948-1950 trilogy November 1918. 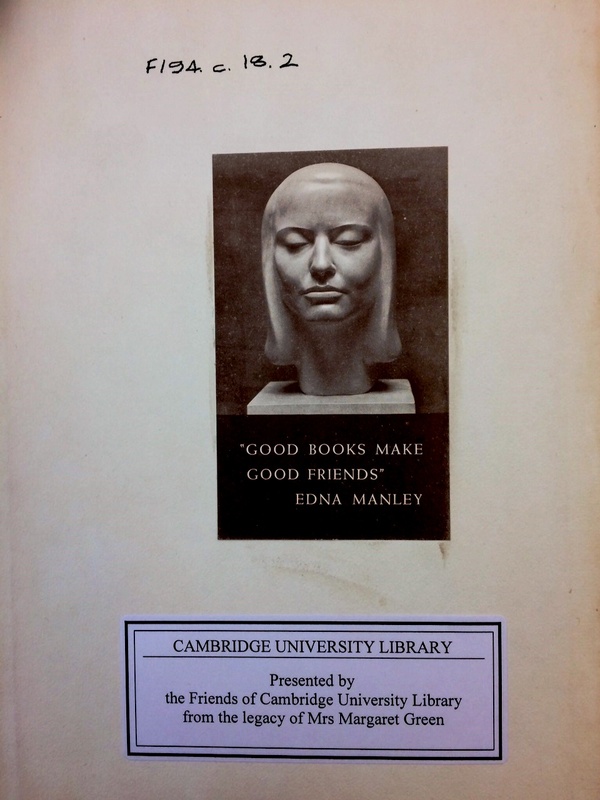 (F194.c.18.2) Our copy has an additional point of interest in that it bears the bookplate of Edna Manley. Sometimes described as “the mother of Jamaican art”, Edna Manley was a notable sculptor, wife of Norman Manley, founder of the Jamaican People’s National Party and chief minister from 1955-1962, and mother of Michael Manley, Jamaica’s fourth Prime Minister. This entry was posted in German, Historical collections, Special collections and tagged buying books, German history, rare books, World War 2 by europeancollections. Bookmark the permalink.